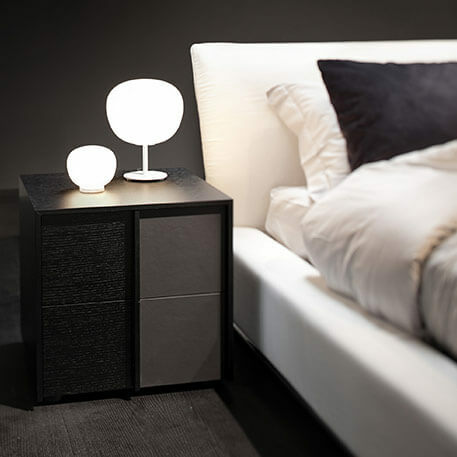 Bedside table lamps: a small light with a big effect! A bedroom without a bedside table lamp is like a frame without a picture. It works, but something is clearly missing! The small additional light has a big effect in the bedroom. It is not just about stopping you from walking into the bed at night-time. It also provides warmth and cosiness and creates a relaxing atmosphere – when you are flicking through an interior design or fashion magazine in the evening, listening to music or reading a book or newspaper. You don’t have a bedside table? Well, there are other lighting options to explore! In other words, there is no reason to have to do without this atmospheric and useful additional lighting. 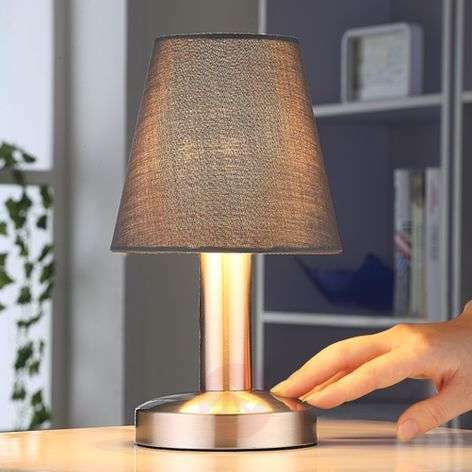 Bedside table lamp are very popular. You don't have a bedside table? Then simply go directly to our section on wall lights. 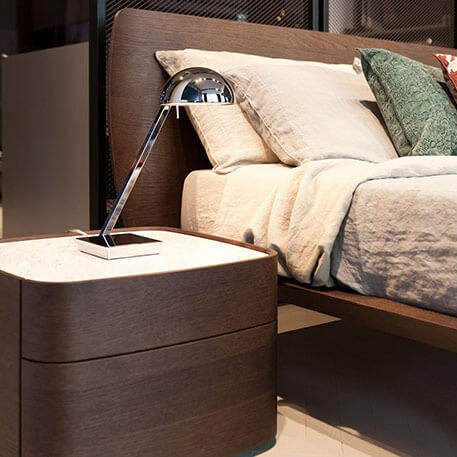 If you do you have a bedside table, you can enjoy the wealth of choice between a trapezoidal, semi-circular or cylindrical lampshade made of fabric or glass and a base made of wood or metal. 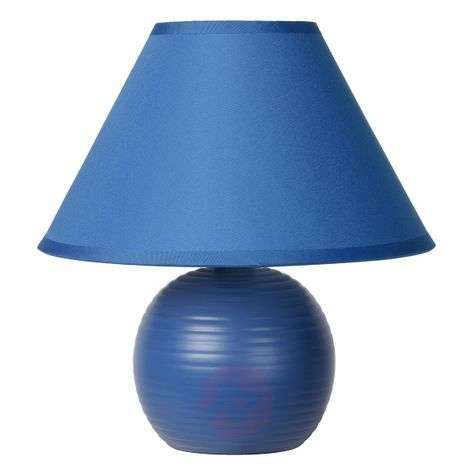 Hundreds of designers have adopted the classic beside table lamp and added new creative shapes to improve it. You can also get additional features, such as a USB port for your smartphone. 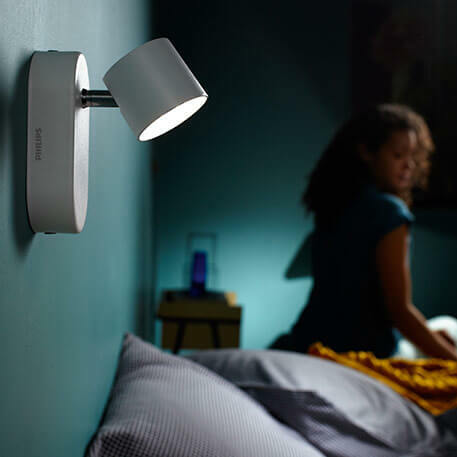 Tip: Bedside table lamps with a touch dimmer! We all know the feeling: it is pitch black and, no matter how hard you try, you just can’t find the switch for the bedside table lamp. It has happened to all of us at least once. 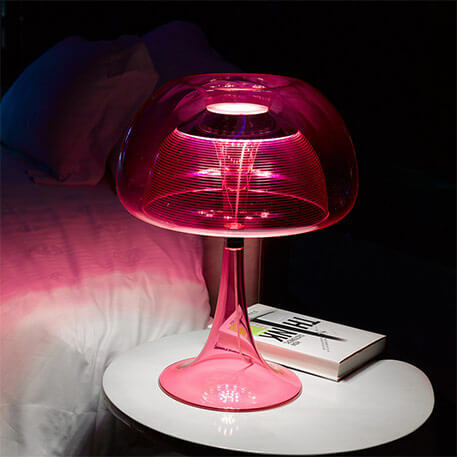 If this is something that gets on your nerves, you will love a bedside table lamp with an integrated touch function. All that you need to do to turn the light on is reach out your arm and tip the base of the light. The light will turn on and even get gradually brighter as you keep pressing it. Super convenient! 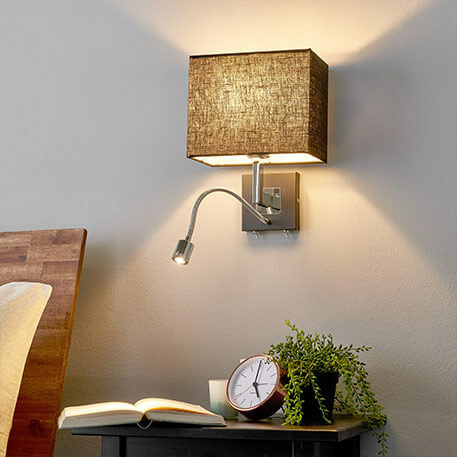 A classic reading lamp is the perfect bedside table lamp for bookworms and newspaper fiends. Both types of avid reader can use the focused light provided by a reading lamp for their hobby. This type of lamp is less about creating a lovely atmosphere and more about practical illumination - and often about great design too! As such, reading lamps comes with a lampshade that bundles the light. Many modern smartphones reduce the proportion of blue light automatically in the evening hours. This is because blue light can have a stimulating effect on our body. As such, when choosing your bedside table lamp, you should opt for a warm white, comfortable luminous colour between 2,700 and 3,300 kelvins. This slightly reddish light has a more calming effect than white or even blue light. 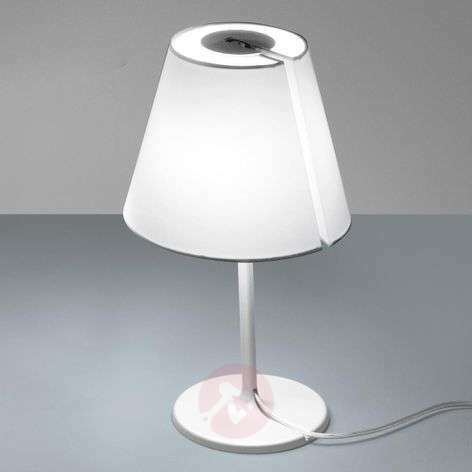 The table lamp is an extremely popular type of light for designers. However, genuinely classic bedside table lamps are rare. But who is to say that you can’t place a timelessly modern Bauhaus-style light on your bedside table? 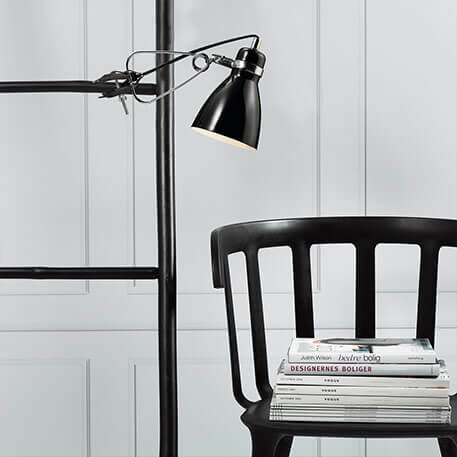 World-famous classics by Artemide - you cannot get more refined than reading with a Tolomeo! More and more manufacturers and designers are using LED light sources. The lights are maintenance-free, emit even lighting and save energy. If you are uncomfortable with the idea of built-in LEDs, don’t worry. The LEDs in an LED bedside table lamp will never break, unless something goes wrong. And if, after several decades, it does stop working, you may well want to buy a new light anyway! The bedside table lamp... for the wall! 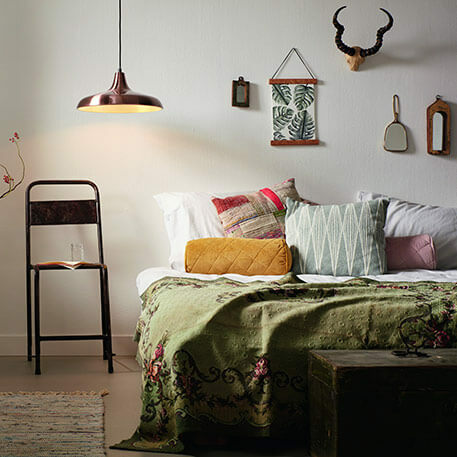 Where should you put a bedside table lamp if not on the bedside table? The answer: on the wall by the bed. This is not actually that uncommon. 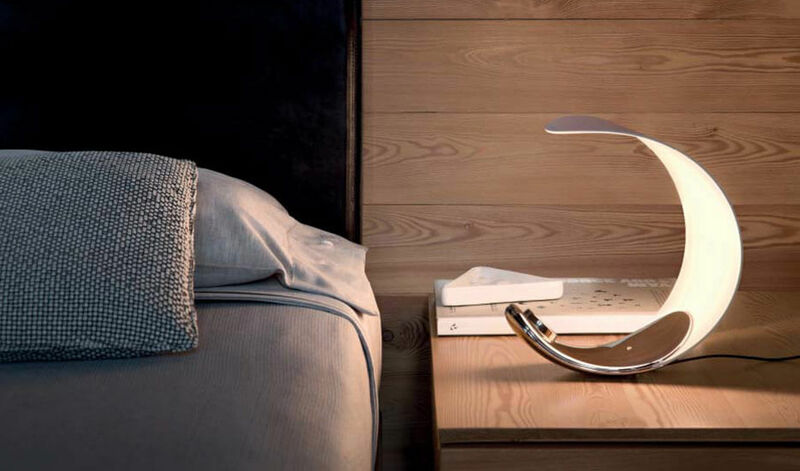 The bedside lamps are installed in this manner in many hotels, ensuring that guests have enough space for their book, mobile phone and watch on the bedside table. As such, wall lights are an option, even if you have a bedside table – perhaps you need space for things other than a lamp. This version of bedside lighting is quite rare. But, as with most rare things, it makes a great impression! Please keep in mind that you need electricity connections on the ceiling, located directly above the bed. Want to move your bed at a later date? Before you install hanging lights, you should plan your bedroom for the long term! This type of light is for people who simply want to have it all – the wall light with an integrated, additional reading light ticks all the boxes! 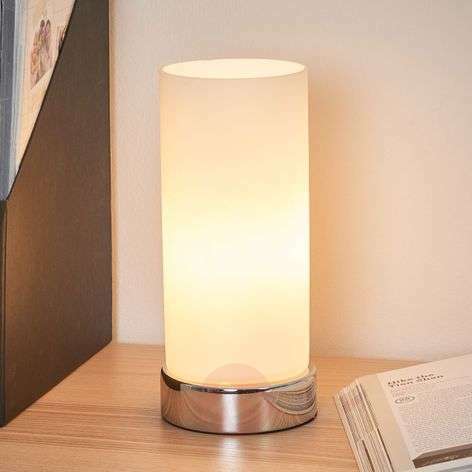 It combines classic dim, cosy lighting with a spotlight-type reading light and doesn’t take up any space on your bedside table. You don’t want to affix a wall light or you’re simply not allowed to because you’re living in a student apartment? It doesn’t matter if it is for reasons of space or because you simply need a temporary solution: clip-on and plug-in lights are a great solution. You don’t know if you should go for a Clip-on light or plug-in light? It depends on the distance from the power point or fixture. A plug-in light that is located near the skirting board won’t be much use for reading. A clip-on light affixed to a shelf a metre away also won’t help much in this regard. The ideal scenario is to have a plug-in light around 60-70 cm above the ground and within arm’s length or a clip-on light at the same height and with a switch that is also within easy reach.